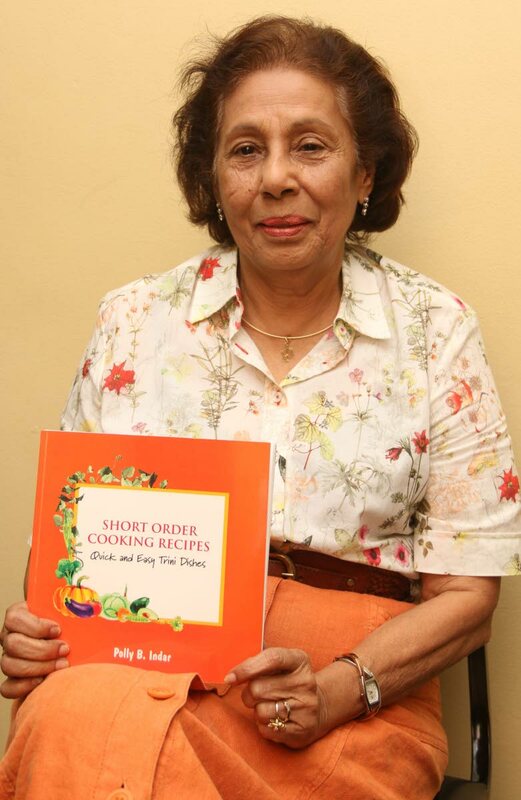 The name Polly B Indar is synonymous with cookbooks. She was one of the people responsible for the popular Diamond Jubilee Cookbook of the Naparima Girls’ High School in San Fernando. This compilation was published in 1997, while Indar worked as a school teacher at Naps Girls. Her latest book, Short Order Cooking recipes, aims at getting people through the kitchen faster. Indar’s desire to be creative with her family menus led to experimenting in the kitchen. “I worked for two short years after which I met my husband, Dr Rupert Indar at a horse racing event and he swept me off my feet and I decided to settle down to married life,” she said. After marriage she continued to look for good recipes for her husband and her four children, who now are all now grown up and empolyed. Indar not only focuses on good cooking but is deeply involved in philanthropy. She is the current chairman of the board of directors for the Hope Foundation home for children. Although she devotes a lot of her time to this home located at Pointe-a-Pierre Road in San Fernando, she loves spending time in the kitchen experimenting with various dishes. “We try all sort of dishes. From Italian to Indian, French and Chinese dishes,” she said, adding that she looks forward to cooking for her family on Sundays. When her children were young they would all help her prepare various dishes on a Sunday. Indar was responsible for putting together hundreds of recipes using local products. In 1991 she did Vegetarian Cooking and Multi Cultural Cuisine in T&T. Once more she has given time and effort to do a third cookbook entitled, Short Orders. Indar has been busy trying out her new recipes which she says are “quick and easy” and are contained in this new compilation. “These are quick and easy Trinidadian dishes that are made from local products, healthy to eat and not expensive at all,” Indar said. She is excited about this publication simply because she has tried all 123 dishes and is happy to share these with the public. Indar says she travelled extensively and has experimented with the various cuisines from the different countries but she thinks that TT has the best ingredients to make all sorts of dishes. “In other countries they may only have potatoes to use as a base for certain dishes but here in this country we can use breadfruit or eddoes or cassava as a base,” she said. Indar credits her travels for giving her the vision to create quick and easy recipes using local ingredients. She said she found great joy in putting together this collection of easy, healthy and economical recipes for busy people and families on the go. “Special attention has been paid to the lowering of fat content and reducing sugar and sodium intake,” she said. She noted that her recipes include local fruits, vegetables, spices, herbs and other ingredients. Channa, she says, is not fried but baked to keep the nutrition in. Short Order features a collection of recipes inclusive of appetisers, soups, salads, entrees, sides dishes and a variety of breads, desserts, cakes, beverages, sauces and condiments. It is available at local bookstores. Here she shares her recipe for the best pone. Combine all ingredients well in a bowl. Pour in a greased baking dish. Bake in a pre-heated oven for 1- to 1 1/4 hours until nicely browned. Reply to "Quick and easy cookbook"